Perennial hardy ferns, also known as native ferns, come in a variety of sizes, shapes and textures. With thousands of varieties to choose from, most gardeners succeed in finding at least one perennial hardy fern to add to their garden, especially for those difficult areas that receive little or no sun. 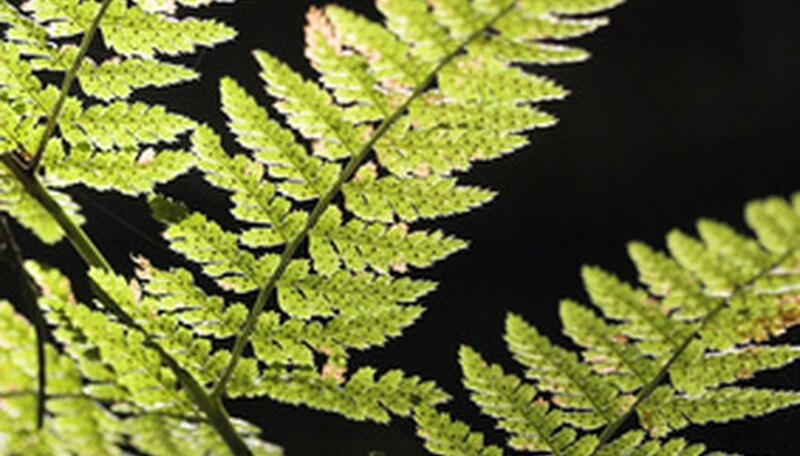 Dating back more than 400 million years, fossil remains suggest ferns may be some of the oldest surviving plants in the world. In the mid-1800s, ferns graced the living rooms and porches of many homes and thrived in the wild, but were seldom added to gardens. The foliage from the Christmas fern, a plant that thrived in the wild, was brought into southern homes at Christmas during the Civil War era and made into wreaths and garlands. A move to add ferns to home gardens began in the late 1800s and continues to this day. Perennial hardy ferns sport fronds, rather than leaves, that grow from rhizomes underground. Fronds may be lacy or leathery depending on the variety. Underneath each frond are spores that help propagate the fern. Ferns grow in size from tiny plants that float on the water to plants that reach 6 feet or more in height. Ferns thrive in forests, and shady wetlands where the plants create an understory important to wildlife and other plant species. More than 12,000 different species of ferns exist. These include shade ferns that thrive in full shade, and variety of sun-loving ferns for the bright garden, which require plenty of water and well-prepared soil to make up for the lack of shade. One exception is the Lady fern, known to be drought tolerant once the plant becomes well established. Another variety of fern, the shield fern, gets its name from the shield-shaped fronds that range in height from 3 to 6 feet. Shield ferns grow well in the south since they thrive in hot, steamy weather. Most ferns thrive in slightly acidic soil in moist, humid conditions. While a few ferns grow in the sun, most prefer full to partial shade. Perennial ferns grow in USDA hardiness Zones 4 to 9. Most ferns prefer moist, slightly acidic soil; adding organic matter or compost to the soil before planting helps overcome this obstacle. After planting ferns, a layer of mulch keeps the roots cool and the soil moist. Ferns planted under trees may require extra watering since trees often take all of the soil’s moisture. Some ferns sport fiddleheads, little rolls of fern appearing in early spring. Fiddleheads from ferns such as the ostrich fern are edible, although fiddleheads from cinnamon ferns are poisonous. The plants work well planted under trees, and thrive in shady garden spots where other plants won’t grow. The fronds of the fern look beautiful alongside cut flowers.